You plonk down your hard-earned money and pick up the new issue of your favourite teen superhero comic. The Mighty Marvel Marketing Machine promises something exciting and new. It's always promising that. But this time, it's telling the truth. Your hero's in the hands of new creators. It's definitely different. And as the shock wears off, you realize it's still a blast. It may even become greater than ever. Is this you picking up the Magnificent Ms. Marvel #1 today? Or is that your grandpa, picking up Amazing Spider-Man #39 in 1966? Ms. Marvel remains the clear Spider-Man equivalent for 21st-century Marvel. Saladin Ahmed taking over writing duties from G. Willow Wilson could effectively be Kamala's shift from Ditko to Romita. A different flavour, but not in any way a downgrade. I'm using a lot of frustratingly speculative language - mights and maybes. That's because this issue fully embraces the fact that Ms. Marvel's real selling power doesn't come from individual issues. This #1 is just the start of a bigger arc, and it's written to the trade with a vengeance. 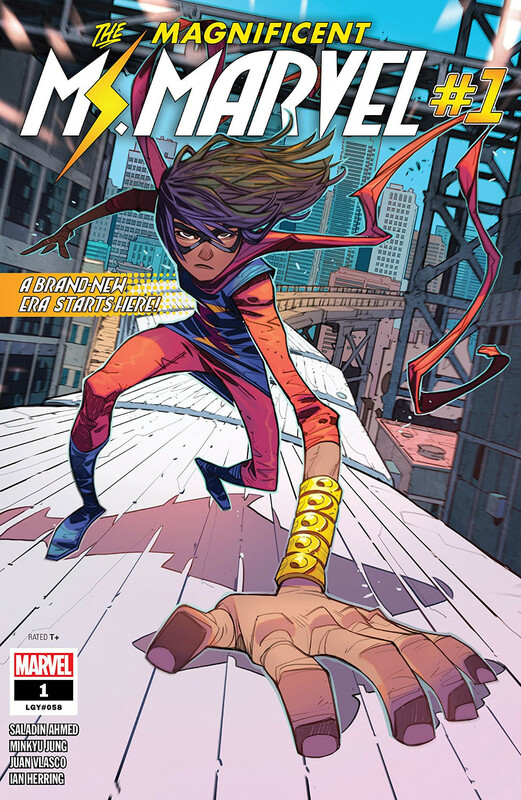 As I reflected last week while reviewing Champions #3, writing for the trade isn't necessarily a bad thing, and this first arc of Magnificent Ms. Marvel could easily wind up great. But the pages presented in this issue - judged strictly on their own - don't quite hit greatness. They're not disappointing, and the pace certainly isn't slow. Kamala tackles a space monster invasion and profound family drama while also artfully tucking an introductory recap for new readers into a nicely-written conversation with Nakia. There's no disappointment to be found in the issue's art, either. Veteran colourist Ian Herring does a particularly great job adjusting the palette to emphasize that this is a new take. The colours are a little more intense, and the space content gets a strong blue-purple scheme that contrasts his standard Jersey City tones in a productive way. The line art on top of Mr. Herring's colours is strong stuff. The new team has taken an excellent approach, honouring the character designs established in previous volumes and re-using them with virtually no changes. Minkyu Jung and Juan Vlasco make a capable team, and they exercise considerable ingenuity and skill in delivering some of the finest fight scenes Ms. Marvel's ever been in. The script presents Kamala and the reader with no shortage of mysteries. There are at least four huge question marks hanging over this arc, evenly split between soap-operatic Kamala-drama and the super-heroic space invasion threat. And this is where the trade-writing becomes a drawback: The answers to those questions are going to be critical in judging the quality of the story arc as a whole. Looking just at #1, it's impossible to tell if they're all brilliant or all dumb or some mix of the two. It is possible to balance long and short-term plotting and pull off a fully-satisfying issue that also contributes to a larger story. But it is not easy, so I'm not penalizing this debut for being open-ended. More development on one - any one - of those big plot questions really would have bolstered this issue, though! Saladin Ahmed's writing has plenty of praise-worthy qualities in the short term. Characterization throughout this issue is superb; this is clearly still the Kamala Khan you know and love. It's not a slavish imitation of what's come before, though; there is also a refreshing novelty to the characters' voices. The dialogue reminds you that Kamala and her friends are growing up, and that job's done so smoothly that it could be overlooked on a casual read. The far-future introductory narration might put you off, but pay attention to the ironic way it interacts with the plot. It's a strong break with G. Willow Wilson's scripting, which (almost) always let Kamala narrate her own story.